Not only is this the weirdest the looking case for the iPad but it’s probably the coolest looking one at that. 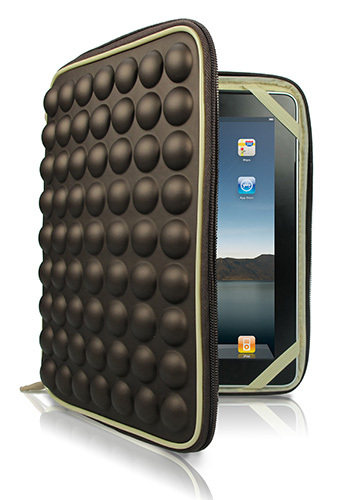 The AeroSphere Sleeve (what a mouthful) from Cygnett is their latest lightweight design to protect your iPad from everyday transport from knocks to bumps and I’m sure if you dropped it, the soft bubble type textures of the case would offer some protection. This technology is built using EVA that is a type of foam and the easiest way to explain it is if you imagine bubble wrap turned into rubber. The texture bubbles are cool to touch as well! With that said, the design of the case is littered with little bubbles that look quite futuristic or something you might expect to find on the Space Shuttle. Installing the iPad was a breeze as you just slide the iPad in and then attach the fasteners. The inside of AeroSphere Sleeve features a faux dur (that means “fake” in the fashion world) type design to ensure that while in the sleeve, your iPad won’t get scratched. It also has a type of elastic fasteners that makes it easy to access the iPad without removing the sleeve or more importantly, your iPad from falling out. All in all, this is one of the better cases and I must admit, probably one of the lighter ones available that comes in three different colours. Recommended!